Through a participatory land use planning programme, we are supporting rainforest communities in Cameroon and Democratic Republic of Congo (DRC) to achieve long-term, sustainable development by gaining greater control over their traditional lands and resources. Starting at the village level, we are working with local communities to develop a rigorous, people-centered methodology that can be scaled-up to higher levels. Access to land and natural resources is essential for the survival of forest communities and indigenous people in the world’s tropical forests. Land use planning is a systematic, multi-stakeholder process that provides a sustainable means for local people to manage natural resources in a way that meets the needs of both current and future generations. Given their strong local knowledge, forest communities have a central role to play in land management, but their participation in land governance is often undermined. This trend is noticeable throughout the Congo Basin, where governments have retained state ownership of land, mainly for the benefit of commercial timber concessions and protected areas. Such allocations have commonly been on lands traditionally used by local communities. This has effectively rendered thousands of people landless, or else pushed to degraded agricultural land deemed unsuitable for commercial logging or biodiversity conservation. In recent years, there has been a wave of land reform initiatives and land use planning efforts in both Cameroon and DRC. As we have seen in other developing countries, decentralising power to regional and local levels has the potential to improve the situation of local communities. In 2016, RFUK and our local partners implemented an ambitious land use planning pilot, building on a wealth of participatory maps created by local communities through our MappingForRights initiative. Our project has since tested participatory land use planning exercises in both DRC and Cameroon. In DRC, we are currently implementing two projects. The first of these is in Equateur Province and builds on our Community Forests project, funded by the Department for International Development (DFID). In 2018, with funding from Germany’s GIZ, we started a second project in DRC’s Maniema Province, aiming to achieve effective community participation in spatial planning and development priority-setting. This will inform land use planning at the local and national level, serving as an example of a more sustainable and equitable approach to land management that could be applied more widely in DRC. 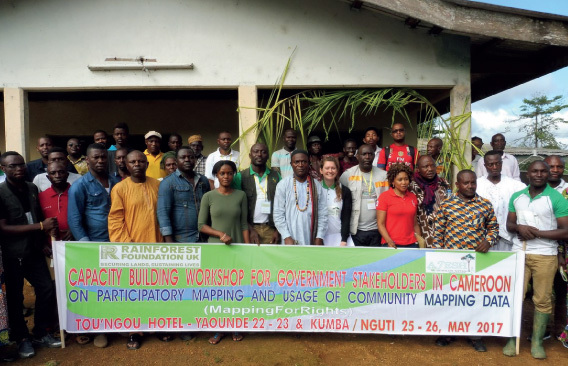 In Cameroon, our participatory mapping work in Nguti Council, in the South-West region, marked the first time all the communities in a single administrative unit were supported to map their lands. RFUK is now supporting community clans in the region to produce their own land use plans and to set up community structures for land use planning. The aim of this study is to make concrete proposals to contribute to the ongoing land reform process initiated in the Democratic Republic of Congo (DRC), which are designed to ensure that sufficient consideration is given to the rights to land and resources of populations living in forest areas.
" We need these community maps because they will help us fight for development in our community... RFUK’s community rainforest map are a very important path to development for us. For women. " " Thanks to this community mapping training with Rainforest Foundation & AJESH, I've learned all the physical features of my community's land. " " Community mapping brings light for the people to see how many resources we have in our village... We want to use these maps to develop our resources in a sustainable way. "